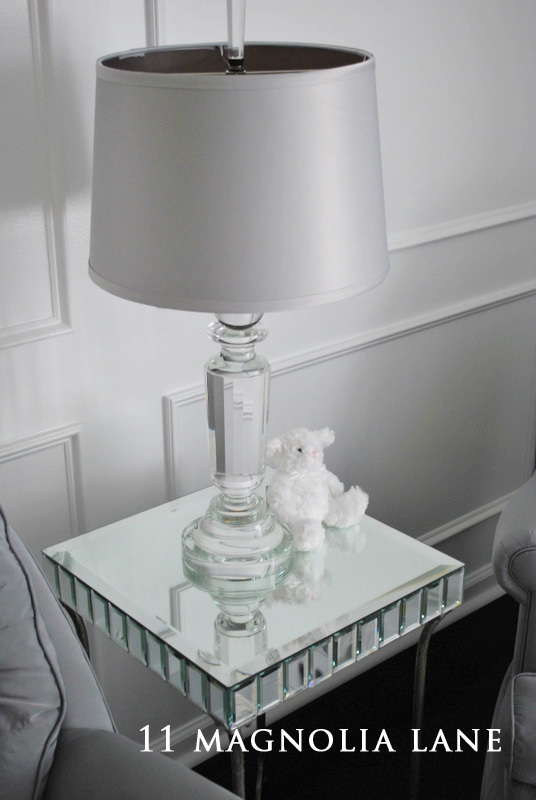 Beautiful moldings, Restoration Kids bedding and mirrored furniture create a magical space for a little girl. It is such a privilege to be sharing this beautiful room with you all today here at a’ la mode. Don’t we all enjoy attempting the “magazine cover lifestyle” with Shelli even though real life doesn’t always allow for it? 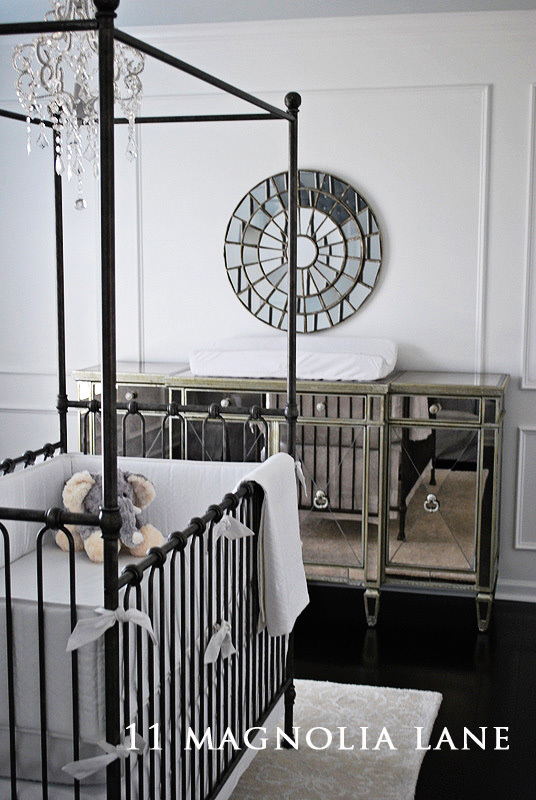 However…in the case of this baby nursery, we think it just might come close! We have been excited to share this gorgeous nursery for a long time over at 11 Magnolia Lane. Once we girls got a peak at this room, you could barely get us to leave! We think it’s stunning. 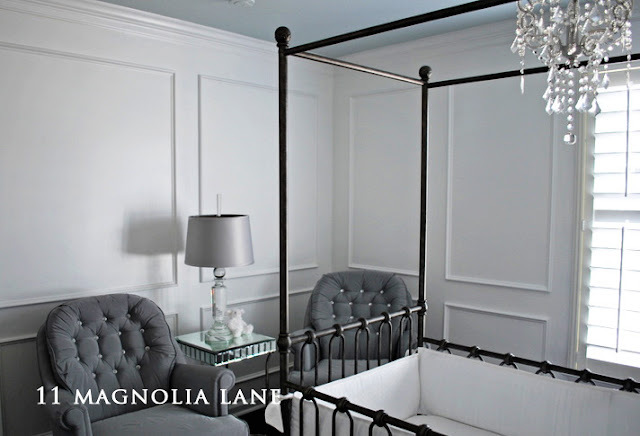 The baby girl’s parents worked hard to transform their spare bedroom with custom moldings, beautiful furniture and luxurious but restful seating for their special newborn baby. While it may look professionally decorated, this talented Baby Mama did the design while Dad did all the carpentry work. They recovered and repurposed furniture from other parts of their home to a wonderful use to welcome their new little girl. 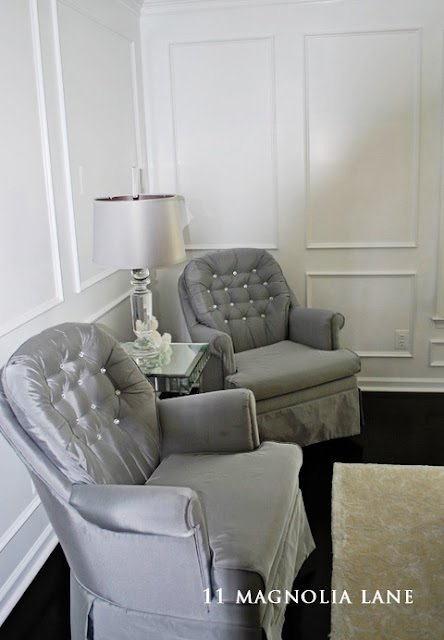 The chairs were redone in a beautiful gray/silver silk and the crystal buttons add a little sparkle. The mirrored cabinet came from another room in their home and is filled with coordinating storage baskets to hold all sorts of tiny “baby” things. The bedding and many of the accessories are from Restoration Hardware and the chandelier was a gift (if you email us at 11magnolialane@gmail.com we can provide the source). The best part of this pretty room is that will certainly grow with this lucky little girl through the years. 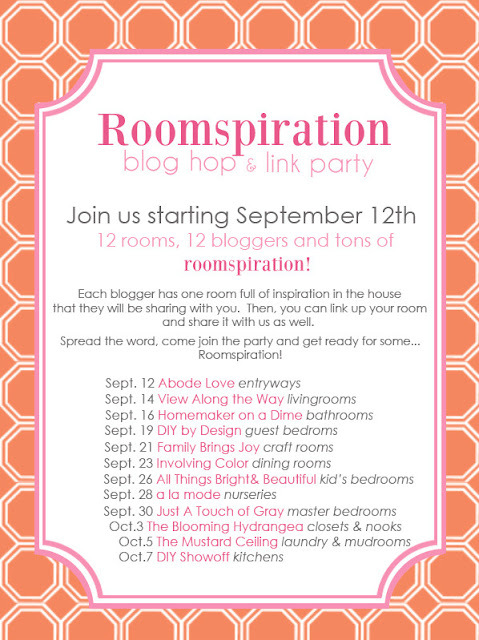 Thanks Shelli, for featuring it today. We can’t wait to see what other beautiful baby nurseries you have for us to see this week. 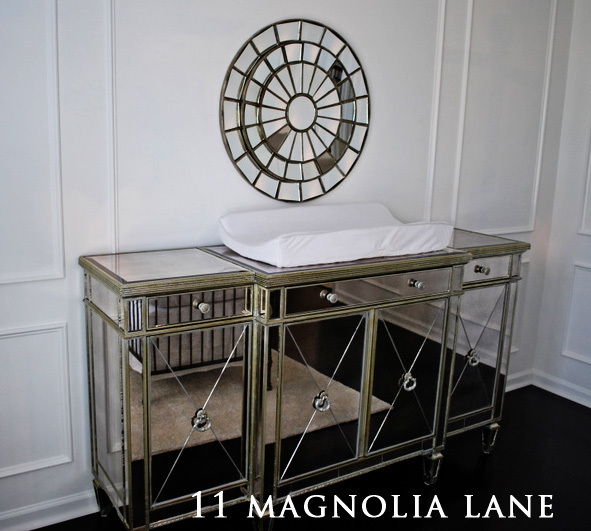 If you would like to see more of what’s happening at Magnolia Lane, please stop over! 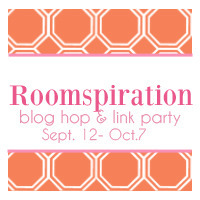 Get your posts ready to share TOMORROW! Love mirrored glass!! tHat's one lucky little girl! Wow. That mirrored furniture is just beautiful. So sophisticated. It has been so fun seeing all of these nurseries.